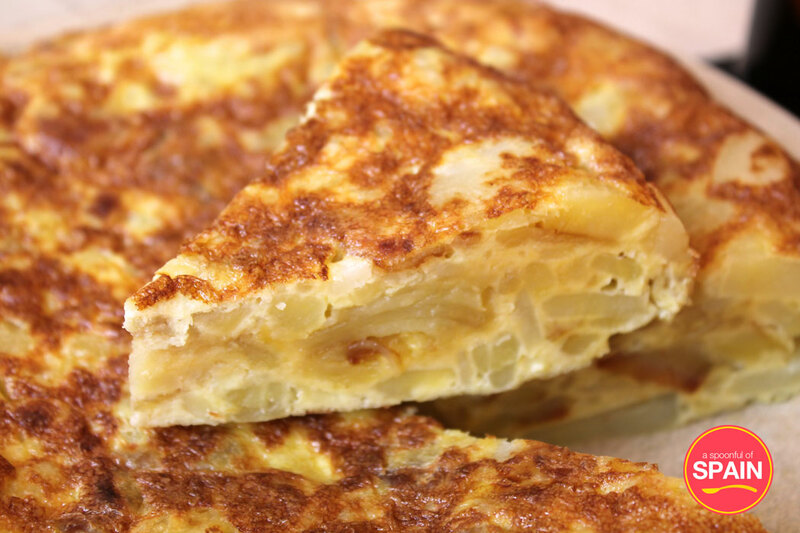 Some would say that there’s nothing more Spanish than a Spanish omelette, or a tortilla de patatas. You can find Spanish omelette served all over Spain. In Madrid, they eat slices of tortilla with coffee for breakfast, and in other places, as a tapa, a ración for sharing, or as a light dinner. Add potato to egg, not egg to potato! This must also happen in a bowl, not in the saucepan! Flip, don’t grill! Grilling makes it a frittata, not a Spanish omelette. Onion is the only permitted extra ingredient. 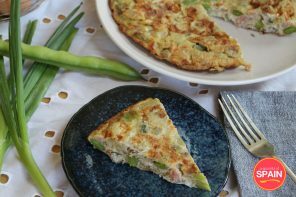 Adding things such as asparagus, prawns or mushrooms is totally valid, but it would no longer be considered a Spanish omelette. Last, but not least, no chorizo! Don’t be scared by the amount of oil in this recipe – you need to use lots of oil so that the potatoes, and later the omelette, don’t stick to the saucepan. 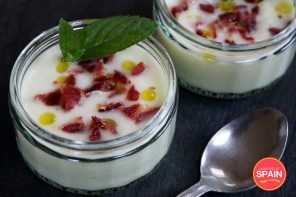 I would also strongly recommend using non-stick saucepans for this recipe – we’ve tried with normal saucepans, and it was a huge disaster! I would also like to highlight the importance of using quality ingredients, especially olive oil. Spanish omelette only has 4 ingredients, and so there is space for each flavour to sing. 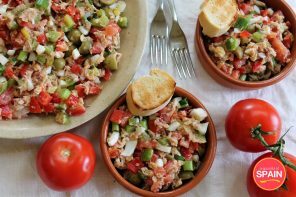 Although it may sound bland, fresh quality ingredients, prepared simply, are the key to classic delicious Spanish cuisine! 1. Peel the potatoes. Cut each potato into quarters, and then slice each quarter thinly. It’s important to work quickly, or your potatoes will oxidise and turn black! 2. Add 150ml olive oil to a wide, deep non-stick saucepan. Add the sliced potatoes and stir to coat evenly in oil. Cover the saucepan with a lid and cook on a medium heat for around 30 minutes. Season with salt to taste. Stir gently every five minutes to make sure that all the slices are cooked evenly. Remove from the heat when the potatoes are golden and cooked through, but not so soft that they crumble apart. 4. Add the cooked potatoes to the egg mixture in the bowl and mix thoroughly. 5. Add the 3tsbp olive oil to a large wide non-stick saucepan. Make sure that oil covers the bottom of the saucepan and turn up the heat to medium. Pour the egg and potato mix into the saucepan. After a few minutes, run a spatula down the sides of the saucepan to make sure that it isn’t sticking, and cover with a lid. 6. After around 7 minutes, turn the omelette over. Move the saucepan from side to side to check that it is mostly set before attempting the flip! You can buy a special utensil that will help you to flip your omelette, but a flat lid or plate also works well. Take your omelette over to the sink, and cover the saucepan with a large plate or lid that is the same size or larger than the saucepan. Turn the saucepan over, leaving the tortilla cooked side up on the plate. Gently slide the tortilla cooked side down back into the saucepan, and return to the heat. Cook for a further 5 minutes. 7. Serve in slices as part of a main meal, or cut into squares for a tapa. If you are need of a carb fest – add slices of the omelette to french bread with ketchup for a bocadillo de tortilla de patatas! Did you manage to flip your omelette successfully? Do you add anything else to your Spanish omelette? Let us know in the comments below!